Stand up paddleboarding is an exciting new sport that anyone can try. This article contains some helpful tips for the new paddler to consider when hitting the water for the first time. Excellent!!! You’ve decided to go Stand Up Paddleboarding or SUPing as the experienced paddler would call it!!! Before I go any further my number one suggestion is to take a lesson or go on a tour with an experienced paddleboard guide or instructor. Now maybe you’re not completely sold on the idea of taking a SUP out, well that’s ok too. 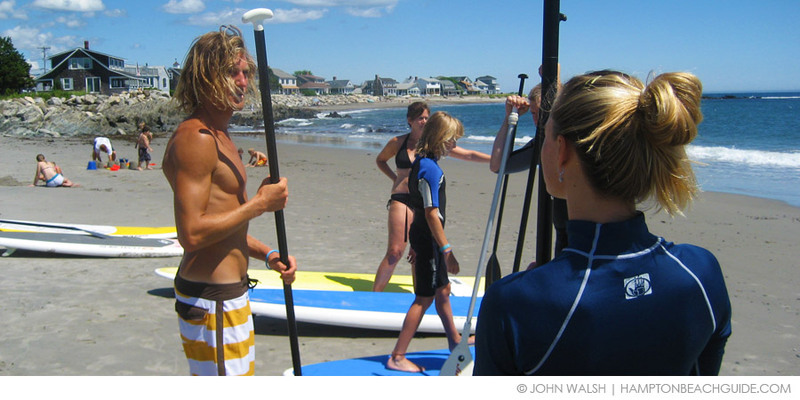 This article is full of great info on stand up paddleboarding basics and some of the things you need to think of while paddleboarding. I’m confident that by the time you’re done reading this you’ll be ready to get out these and give it a go! The first thing you may ask is “why are these boards so big?” and “how am I supposed to get this thing to the beach?”. The boards are big because they need to be able to fully support your weight and boards in the 10 to 12 foot range are common. As far as carrying them goes they are surprisingly light and weigh in the 25 to 30 pound range. They also have a handle built into the board so you only need one hand to carry them leaving your other hand free to carry your paddle. When launching your board into the ocean your best bet is to look for a calm spot and to wade into about waist deep water. Pull yourself onto the board and get into a kneeling position. Test the paddle out and take a few strokes, get a feel for the board and when you’re ready stand straight up! At this point you are officially stand up paddleboarding! Now as far as standing on the board goes you want to be facing forward with your feet about shoulder with apart. Generally the handle you used to carry the board to the water marks the center point of the board and your feet should be on either side of it. Don’t bend over at your waist, keep a slight bend in your knees and keep your shoulders above your hips. Focus on keeping your core muscles engaged in your thighs, stomach, and back. Now when it comes to the paddle it’s important that the paddle is the correct length for you. Ideally the paddle should be about 8 inches taller than you are. Many paddles are adjustable so start off with 8 inches above your head and adjust as need be. One hand should be on the end of the paddle gripping the handle and the other should be holding the paddle shaft about one third of the way down from the handle. When you switch from paddling on one side of the board to the other you also switch your hands around on the paddle. Remember, paddling and generating a little speed will greatly increase the stability of your board! I also wanted to touch upon SUP safety while I have your attention. Always wear a leash, one end attaches to your ankle and the other to the board, that way if you fall you won’t lose your board or send it into any nearby swimmers. You always want to be aware of which way the wind is blowing when heading out on your SUP. It’s easy to cover a great distance with the wind at your back but it can be tough to cover that same distance when paddling directly into the wind. If you get in trouble don’t be afraid to get on your knees, put the paddle between your legs and use your hands to paddle. Lastly, when entering and exiting the surf zone always keep your board to your side, never let it get between you and the waves. The last thing you want to do after a great paddle is get knocked over by your board!